Egidija's Notebook: ESSAY. Yakimono. David Maisel. 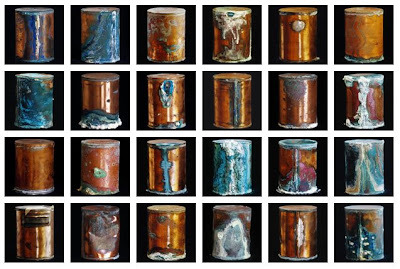 Library of Dust is a haunting series of images by David Maisel, who photographed a collection of corroding copper canisters containing the cremated remains ("cremains") of patients at the Oregon State Insane Asylum from 1883 to 1971. The canisters are beautiful. The topic is disturbing. 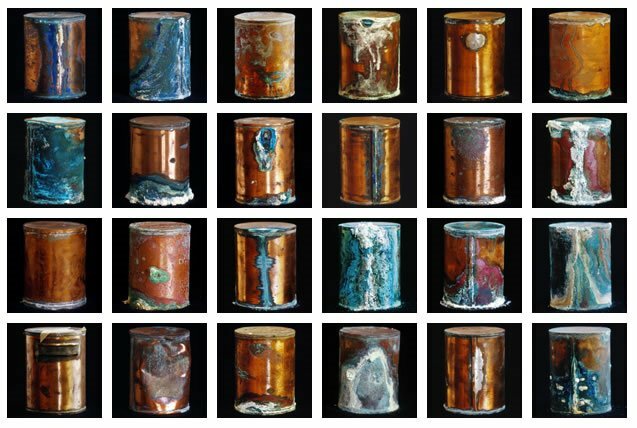 The abandoned remains have reacted with the copper to create colourful deformations on the canisters that often appear to be bubbling over. Bubbling over with death, neglect, the effects of mental illness, yes, but at the same with the spirit of individuals who have finally come to embody beauty. The asylum itself is decaying when Maisel first visits, and the photographs depict large slices of peeling pain and tiles curving free of the floor, a reflection of the previous disorder. These photographs will lead to pensiveness and quiet wonder. The visual poetry is beautiful, bewildering and bewitching. Yakimono - a Japanese word for ceramics - literally means "firied" (yaki) "things" (mono). That explains everything!